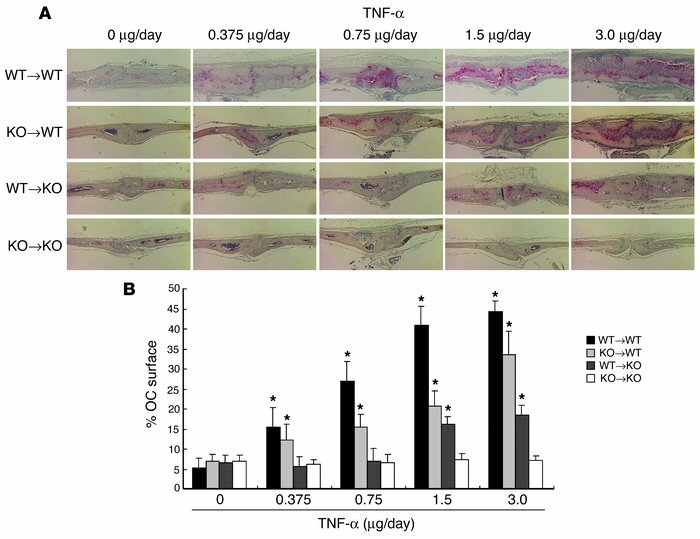 Macrophage and stromal cell responsivity to TNF-α are required for optimal TNF-α–induced osteoclastogenesis in vivo. (A) Histological sections of calvaria excised from WT to WT (WT→WT), WT to KO, KO to WT, and KO to KO mice after 5 daily supracalvarial injections of increasing doses of TNF-α were stained for TRAP activity (red reaction product). Magnification, ×40. (B) The percentage of BM interface covered by osteoclasts was histomorphometrically determined in specimens derived from WT to WT, KO to WT, WT to KO, and KO to KO mice. *P < 0.01 compared with KO to KO mice. n = 3 mice per group.